In a world where violence and bullying seem to be common, some parents are wondering how we help our children be happy and successful. Happy children have good self-esteem, demonstrate resilience, and feel valued in their families. Experts agree that happy children share certain characteristics like optimism and a sense of control. 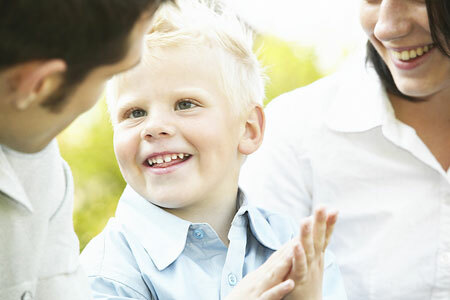 How can parents create a supportive family atmosphere to create happy and successful children? One characteristic of happy children is strong self esteem. You play a major role in laying a solid foundation for your child’s esteem. In the June, 2001 issue of Journal of Family Psychology, the NICHD (National Institute of child Health and Human Development) Study of Early Child Care has found that fathers who had high levels of self esteem were more involved in caring for their children than were fathers with lower self esteem. In their book, Full Esteem Ahead, authors Diane Loomans & Julia Loomans suggest asking your children, “What makes a happy home.” The answers they received from children and parents were not about big gifts or exotic vacations, but rather about the simple things. “Instead, feeling good, encouragement, kindness, play, and connection with mom or dad are at the top of the list.” Loomans & Loomans report. http://www.innerself.com/Parenting/creating_a_happy_home.htm. After my father’s funeral I was sorting through old 50 years worth of family pictures. In one picture, my father was home after the war, and holding his first daughter. He was smiling broadly and hugging his daughter warmly. I felt sadness when I realized there were few times that I, daughter number four, ever saw my father smile. He was at a different phase in his life and had six children by then. But I realized what a difference it would have made to me personally, as I never saw him as a happy person. Take a smiling inventory of yourself: Do you smile often? When you smile, is it at your children and your partner? Think about the first times your children see you after a period of time: in the morning, before going to school, coming home from school, as you put them to bed. Do you smile at these times? Taking a smiling inventory of your family. One weekend when family members are around, keep a notebook handy and observe when and who is smiling. Share this with the rest of your family when all are gathered. Better yet, call a special meeting, and discuss the smiling opportunities. How can we increase this great and simple act? Daniel Goleman, author of Emotional Intelligence, states that 80% of success in the world comes from emotional aptitude, not just intellectual talents. Therefore, developing an emotional aptitude is critical to success. As a parent, how can you foster a strong emotional aptitude for your children? By creating a positive supportive atmosphere at home. Within the family, children learn who they are and how they are valued. They internalize ways of coping with life through family interactions every day. The overall atmosphere you create can clearly make or break a child’s ability to feel confident and successful throughout life. When you set up a supportive environment in your home, you will help your children grow up in a well-rounded way. The following behaviors for fostering the kind of atmosphere that breeds success have been identified by four respected mind/body scientists, authors of Mind/Body Health: The Effects of Attitudes, Emotions and Relationships (published in 1996 by Allen & Bacon). 1. Nurture a strong identity with the family and a strong connection to it. This promotes a sense of belonging and feeling of safety for your child. 2. Renew your child’s sense of purpose at each development stage. Knowing to aim for some activity – e.g., learning to walk, playing soccer, meeting friends, graduating, etc. – keeps a child’s eye on a specific goal and teaches persistence. The value attached to each accomplishment sets the foundation for success. 3. Allow your children to have choices (within appropriate boundaries). This behavior nurtures responsible free will and leads to a belief in their ability to control their own world. 4. Completely accept your child as a person. This develops self-esteem and models the ability to accept others as they are. 5. Expect positive outcomes from your children, e.g., Sally will try out for the basketball team and you show your belief that she will be selected. Communicating that expectation creates a critical sense of desire to achieve. It also helps them nurture hope in tenuous times. You can do a number of things to encourage your children to believe in themselves and develop emotional strength for life. Speak to them about their strengths. Teach them they’re capable of overcoming their fears. Assist them in learning new skills. Shield them from too many failures. Witness and value their efforts. Support their gifts and dreams. Foster an “I can do it” attitude. Most importantly, pour on the caring love. As a parent with human qualities, you may not find it possible to always love your child in the unconditional way so many parenting books suggest. A caring love, on the other hand, respects a child while providing the necessary structure for nurturing happiness and success. More ideas for empowering your children can be found in Nurture Your Child’s Gift: Inspired Parenting by Caron B. Goode, Ed.D. (Beyond Words Publishing) and at www.inspiredparenting.net or at www. Academyforcoachingparents.com. Caron Goode’s (EdD) insights are drawn from her fifteen years in private psychotherapy practice and thirty years of experience in the fields of education, personal empowerment, and health and wellness. She is the author of eight books and the founder of the Academy for Coaching Parents, (www.acpi.biz) a training program for parents & professionals who wish to mentor other parents. A mom and step-mom, she and her husband live in California. Dr. Goode is co-hosting the Raising Great Kids Parenting Telesummit in January with Dr. Minette Riordan, publisher of North Texas Kids. This is a free parenting program. Learn more here.